A delightful recital of English Song was given on Saturday at the Spring Arts & Heritage Centre, Havant by baritone Alex Poulton and pianist Peter Rhodes. The recital was presented by the Southern Branch of the Elgar Society, who run regular events at this venue. Beginning with a selection of songs by Elgar, they moved onto selections from both Somervell and Butterworth’s settings of Houseman’s A Shropshire Lad. These were separated by one of Alex’s own compositions, April Moon. The first half concluded with three of Benjamin Britten’s folk-song arrangements. The second half was taken up with Finzi’s song cycle of five Shakespeare songs Let us Garlands bring, before finishing with Noel Coward’s Mad Dogs and Englishmen and Ivor Novello’s And her mother came too, which served as an encore. Alex is a fine baritone and a great communicator; all his songs were not merely sung but performed. Body gestures and facial expressions contributed to the delivery, especially in the comic pieces. He was ably supported by Peter Rhodes with unfussy, delicate and careful accompaniment. Peter also contributed two solo piano items by Percy Grainger, The Irish Tune from County Derry and Dowland’s Now, oh now I needs must part. Alex studied voice at the Franz Liszt Academy in Budapest and Weimar and has performed in major festivals throughout Europe and in many of the worlds leading concert venues. Peter studied at the Royal Academy of Music and has been heavily involved in Opera. 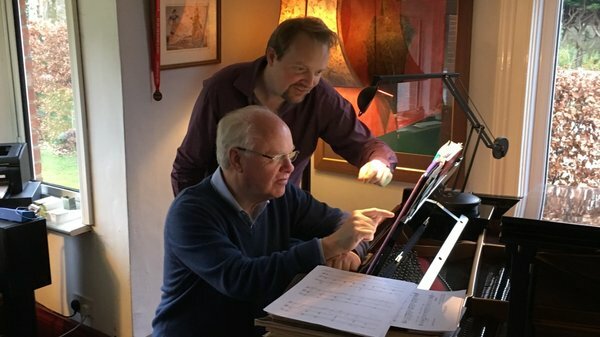 Alex and Peter are performing together in another recital in May at Stansted House.